Create & Send Invoices, Manage Taxes & VAT. Collect One Time & Recurring Payments. Manage your invoices and Payments Gracefully! Invoicing has got you covered... free of charge! 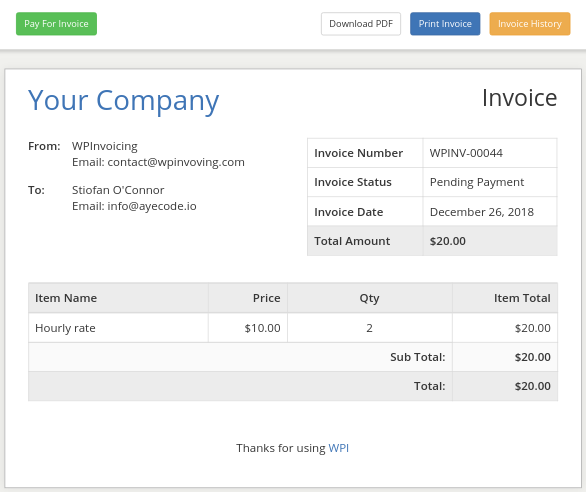 Create and send invoices for your freelance work from within your WordPress website. Invoicing can also be used to create and send invoices for just about anything! Do you need a system to generate invoices and receive payments for a new plugin that you are developing? Invoicing is what you need and it's super easy to work with. With Invoicing for WordPress, you can manage taxes and VAT for European countries and it is compatible with VAT MOSS (Mini One Stop Shop) to report and pay VAT due on sales of digital services to consumers in the EU. The sytem will detect visitors from any of the 26 European Countries and will automatically charge the correct VAT rate when applicable. Your customers will be able to settle your invoices directly on your website via our many online payment gateways or via one of our offline payment gateways (Bank Transfer, Cash in hand, Cheque Payments). Paypal, Stripe and Authorize.net (and many others) include options for recurring payments too. Developers: customize and extend the plugin infinitely using hooks and filters. Have a look at our documentation. Invoicing has been designed to be easily customizable. Level up your Invoicing system with our premium add-ons - 30 day money back guarantee! Buy them individually here or subscribe for the bundle. Your experience with UsersWP is our top priority. That's why we offer free support for our core plugin and premium support for add-ons. Join us in our Forum, where our team of six dedicated support staff, including four developers, are wholly focused on making your experience with us rock. Maybe you need help figuring something out, or perhaps you need a hook we did not supply. No worries, just hit us up in the Forum we can't wait to hear from you. You can look forward to a friendly and fast response from a human being, totally competent to solve your problem. Of course, it may be that we already solved your problem. You can check first in our comprehensive, fully-searchable archive of instructions, manuals and troubleshooters. Across thousands of documents, we offer guides and in-depth tutorials on every aspect of using the plugin, from tips and tricks to developer guides and soon we will have a full codex. Only $99, including 1 year of support, updates and all new products released.